Language level: I try to make all of my lessons easily adaptable to different levels, but this is geared more towards beginners. For more advanced students, it will be review. 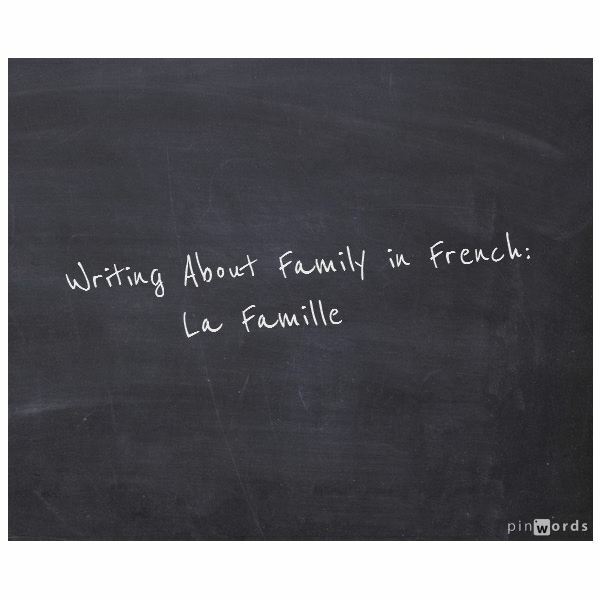 For this lesson on writing about the family, your students will begin by learning basic family vocabulary, and they’ll pull together the basics they’ve already learned about simple sentence structure and verbs like être and avoir. Format: I’ve kept the format very simple to avoid too many layout issues. Paste the text into a document, and you can make the changes you’d like to make. I’ve given you a Student Section (below) which you can copy to a document, so you have something to hand out to your students. Your students will be able to follow along and make notes on the page as you talk about the different parts of the lesson. This Teacher Section will have tips and suggestions to share with them. *Teacher: Some students aren’t comfortable talking about their families, so I tell them it’s ok to make it up! The whole point is to use the vocabulary and to put together sentences. *Teacher: You may have to add words to fit different family make-ups. Hint: If “sœur” is difficult for them, remind them to ignore the -o and that leaves them with -eu. Possessive adjectives personalize your writings about your family. You wouldn’t want to constantly say, “I have a mother. I have a brother. I have an aunt.” You can use the different forms of “my” (mon, ma, mes) to vary your sentences. You won’t need a lot of verbs to talk about your family: Être, avoir and habiter should be enough for most descriptions. *Teacher: Examples tend to work best, so I’ve included some basic sentences to cover many situations. You can add as many as you’d like, and your students can take notes on their copies. Don’t forget to remind your students to also use words like “et” and “mais” to vary the sentences more. a. J’ai un frère/une sœur. J’ai deux frères./deux sœurs. b. J’ai un petit frère/une petite sœur. J’ai un grand frère/une grande sœur. *You can also teach aîné, cadet, etc. It’s depends on how much time you have to spend on the family lesson. d. On n’a pas d’animaux. f. Mon oncle s’appelle Marc. Ma tante s’appelle Marie. g. J’ai un oncle qui s’appelle Marc et il a 50 ans. h. Mes parents s’appellent Sophie et Pierre. Mes parents sont Sophie et Pierre. a. Mon frère est marié. Ma sœur n’est pas mariée. b. Mes parents sont divorcés. Ma sœur est divorcée. c. Je ne suis pas marié(e). Je suis célibataire. d. J’ai un frère/une sœur qui n’est pas marié(e). a. Mon frère a 14 (quatorze) mois. Mon frère a 1 (un) an. b. Mon frère a 9 (neuf) ans. c. Mes deux sœurs ont 13 (treize) ans et 14 (quatorze) ans. d. Mon cousin habite 9 Rue Corbert. Ma tante habite une grande maison/un bel appartement. e. Mes grands-parents sont en France. / au Méxique. Download the Student Section Here.